Affiliate is a system that benefits mutual parties. Recommend someone about our site by asking them to click through ‘affiliate link’ and you will be rewarded with a certain percentage once someone made a purchase! You will receive your very own affiliate link once you join! Everyone is free to join this affiliate program as long as you have a social network account, be it Blog, Youtube, Facebook, Twitter, Instagram or others! 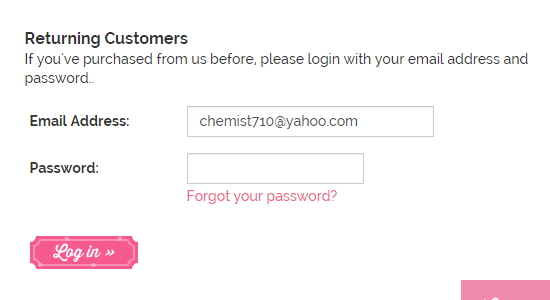 Login as returning customer or Register a new account for new user. 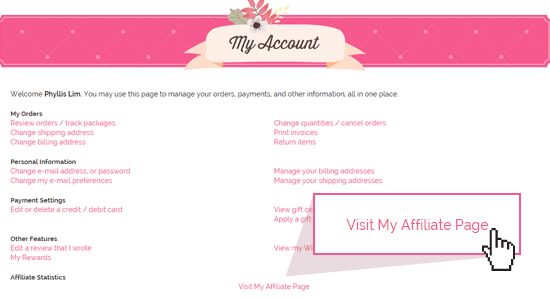 After login as customer, scroll down the website & look for the page 'Affiliate'. Read the terms & conditions about our affiliate program and press continue at the bottom of the page. Key in your website address & website category then press continue. Finished! You can start affiliating! 10% commission* will be made for the first tier referrals (whoever click through your link and made purchase). 1% commission* based on sales generated by your sub-affiliates. Commissions are based on product purchased, excluding shipping and taxes. *Commission refer to any sale that has successful payment, Noted that NOT all your affiliate order made the payment to us. Some of them may abandon the cart. We will provide a detail report to let you know which of them made the payment. What is your affiliate ID? 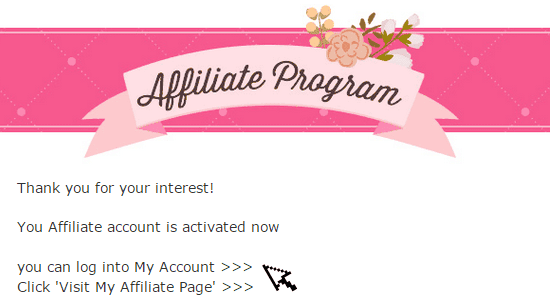 Your affiliate ID is the figure at the affiliate link. Skrill is the payment method. The minimum payout is gross earnings of USD50. Payment will be transferred via Skrill. Or you can choose to have store credits as your option too (minimum gross earnings of USD30 commission accumulated). You will need to contact us for the affiliate commission payout. Where do I check my affiliate results and commission and to download banner? Secondly, click the My Affiliate Page link. You can then choose the size of the banner that suits you. Cookies are set at 90 days. This means if a potential customer click through your affiliates link and made purchase within the next 90 days, you are entitled to his or her sales for commission. How to boost up your sales? 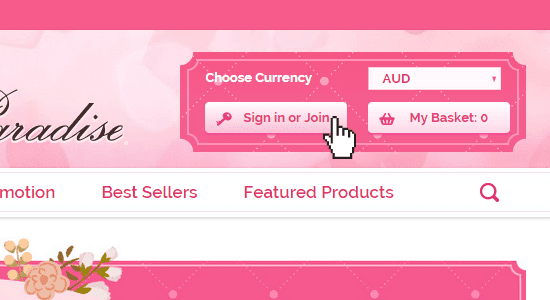 You can post any promotion of PinkyParadise to all your social media website and share it with your followers which could help your followers to make purchase , thus, increasing the conversion rates of yours. Secure best position for the banner or the link. For example, the top right or top left corner of your blog would be the best position to place the banner or place the affiliates link in the first 50 words description in the youtube channel. Give your readers a call to action by providing them with your affiliate link. By providing them with the coupon code, this will increase their interest in buying the product. Always ask for a coupon code, where mystery gifts will be given on each purchase. Please fill in the form below for the coupon code. Why my Affiliate account was terminated? Acquiring visitors through a non-organic method i.e through Adwords /any third party advertisement medium. The same applies to promoting the affiliate links with such medium. 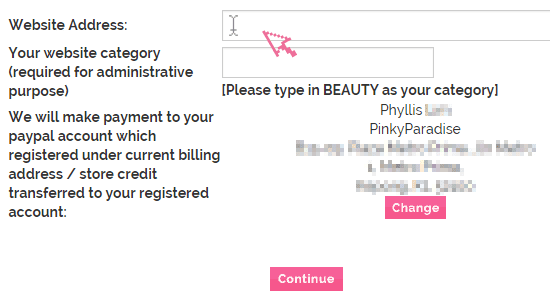 Pinkyparadise has the right to hold the payment of commission, and proceed to investigate the unusually high conversion rate. Affiliate partner is prohibited to make any purchase of our products, through the affiliate link. This applies to all the account(s) owned by a single owner. Such act will also cause the affiliate commission earned by the affiliate partner account(s) to be forfeited at the immediate effect. Affiliate link is meant for the fans/visitors of the affiliate account owner only. 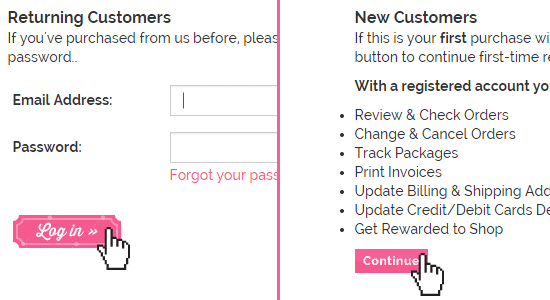 Pinkyparadise will determine the affiliate account/commission eligibility, on all the above terms based on our discretion. Shall the affiliate account owner breach any of the above terms as determined by Pinkyparadise, the account will be terminated at the immediate effect, as well the commission relevant to it. 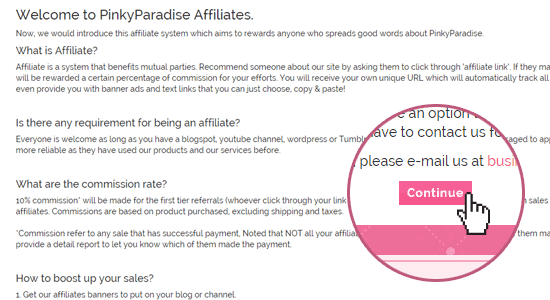 Pinkyparadise reserves the right to investigate / forfeit affiliate commission based on our discretion. Affiliate Partners are only allowed to claim affiliate commission within the last two years from the date of claim. For accurate affiliate commission report and claiming of the commission, please contact fill in the form below.